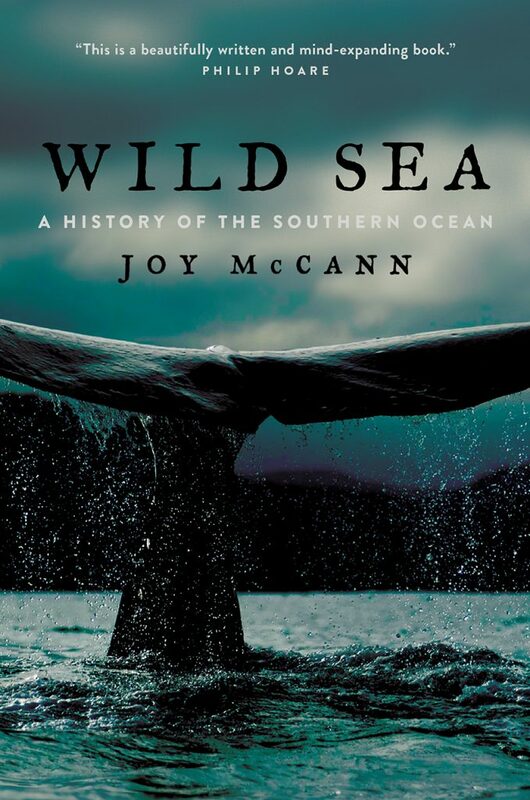 In her new book, Wild Sea: A History of the Southern Ocean, Joy McCann reveals the secrets of elusive Southern, or Antarctic, Ocean, weaving together sea captains’ journals, whalers’ log books, explorers’ letters, scientific research, and ancient beliefs with her own travels there while researching the book. We sent McCann a few questions recently to learn more about her motivations for writing the book. First, just where is the Southern, or Antarctic, Ocean? This might seem a straightforward question of geography, but you explain in the book that the exact borders have actually been contested since the early twentieth century. The simple answer is that the Southern Ocean flows completely around the Antarctic continent in the high southern latitudes, uninterrupted by any landmass. Unlike the Arctic region, where ocean is surrounded by land, the Antarctic region comprises land surrounded by ocean and encircled by twenty tiny sub-Antarctic island groups. It is the world’s only circumpolar ocean, and it was formally recognized as the world’s fifth major ocean in 2000 because of its distinctive physical and biological characteristics. As I discuss in Wild Sea, however, the question of Southern Ocean geography is complicated. The northern limits of the ocean are indistinct because its waters merge with those of the Pacific, Atlantic, and Indian Oceans. It was this lack of any terrestrial boundary that gave rise to international disagreement over the course of the twentieth century about just where to draw the line! I allude to this contested northern boundary in the Prelude to Wild Sea, noting that it is “a difficult ocean to pin down . . . a fluid boundary that defies the neat lines of a cartographer” (p. ix). My notes to the Prelude briefly chart the history of the IHO’s attempts to create a uniform system of nautical maps and charts, beginning with the first edition of the Limits of Oceans and Seas in 1928. 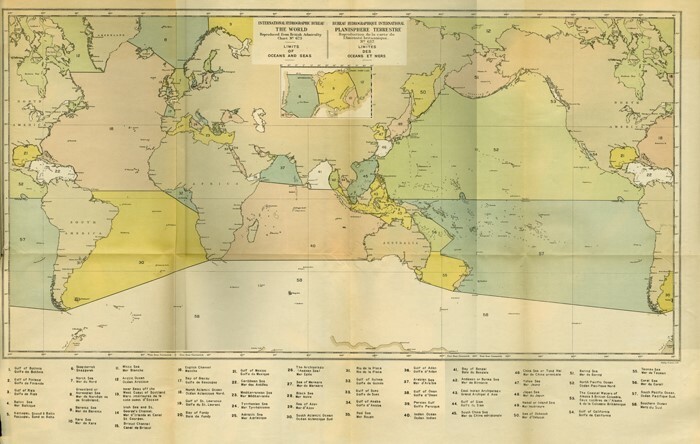 This is the map that accompanied that first edition, showing the Southern Ocean flowing between Antarctica and the southernmost coastlines of South America, South Africa, Australia and New Zealand. The IHO revised the boundary southward in 1938, then in 1953 the Southern Ocean was omitted all together because of the difficulty of drawing a line in the ocean. Member nations were invited to draw their own northern limits and, in the absence of any international agreement, the 1953 version remains current. From a scientific perspective, however, the northern limits of the Southern Ocean are now widely recognized as a transition zone between the cool, fresh, nutrient-rich sub-Antarctic waters to the south and the warm, salty, nutrient-poor subtropical waters to the north, roughly along the line of latitude 40 degrees South. For readers who may be interested to learn more, my blog post provides further explanation of this history, together with IHO maps that illustrate the shifting boundaries of the Southern Ocean. Within a century, popular and scientific perceptions of the Antarctic Ocean have changed dramatically. Can you tell us a little more about this? In Wild Sea I discuss how perceptions of the Southern Ocean changed over time and in different cultural contexts. The most profound shifts occurred in Western thinking during the twentieth century, reflecting changes in how the ocean environment was understood and valued. The Southern Ocean whaling industry, for example, began in the early nineteenth century with shore-based whaling stations operated by small, privately-funded companies. By the mid-1920s, steam-powered factory ships had largely replaced catcher boats and shore-based whaling operations. This new style of pelagic whaling was highly efficient and lucrative. It was also catastrophic for the larger whale species of the Southern Ocean. I cite some statistics in Chapter 6 to illustrate the impact of industrialized whaling in the region. Over a period of seventeen years, the number of whales killed annually increased from 8448 in the 1920–1 season to 46,039 in 1937–8. In the 1930–1 season alone, the total whale catch included a record 29,400 blue whales, the largest creature to have ever lived on Earth. With the dramatic decline in whale numbers threatening the sustainability of the southern whaling industry, the British government instigated a series of research expeditions in the waters around South Georgia between 1925 and 1951, known collectively as the Discovery Investigations. The aim of the program was to study and gather information about whale biology and behavior in order to better manage whale numbers, and to ensure a future for the southern whaling industry. Interestingly, the research was paid for by a levy imposed on whalers, revealing the close alliance at that time between scientific and commercial interests. Even then, however, there were voices calling for restraint and warning of the extermination of whole species if indiscriminate harvesting was allowed to continue. In 1931, twenty-two whaling nations agreed to the first international regulatory agreement on whaling activities, following by the creation of the United Nations International Whaling Commission in 1946 and the International Convention for the Regulation of Whaling in 1948. By the time South Georgia’s last shore-based stations ceased operations in 1965, it was abundantly clear that there were too few large whales remaining in the Southern Ocean for the whaling industry to remain commercially viable. The last whaling operations ceased in Australia and elsewhere during the 1970s in the face of widespread anti-whaling sentiment and declining markets for whale products, and in 1982 the International Whaling Commission introduced a commercial whaling moratorium which remains in place today. 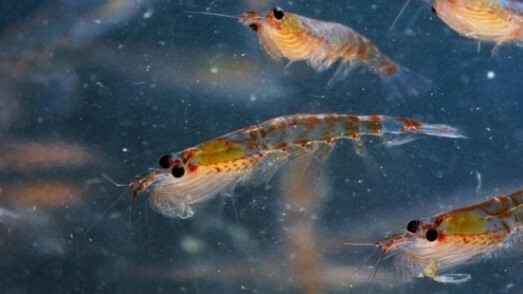 Antarctic krill (Euphausia supberba), reproduced in Wild Sea with the kind permission of David Tipling. The story does not end there. Indeed, it was the Discovery Investigations’ research on Antarctic krill, the main food source for southern baleen whales, that led to one of the most important shifts in perception: that the Southern Ocean was not an inexhaustible resource but a fragile ecosystem, not simply a habitat for individual species, but an interconnected whole in which changes affecting one species could be expected to impact on other species, as well as on their physical environment. You mention in the book that the Antarctic Ocean and continent are considered to be a barometer of global warming. Indeed, Antarctica was in the news again recently when scientists discovered a cavity growing within a glacier two-thirds the size of Manhattan. Could you talk a little more about what makes the region such a useful barometer? During your travels, what was some of the most compelling evidence you saw for climate change? When we talk about the impact of climate change in Antarctica, the discussion invariably turns to the implications of the melting polar ice caps for rising sea levels. That is certainly one of the most important measures of global warming in the Antarctic region, but in Wild Sea I focus on ways that the ocean itself is signaling the changes occurring in its depths. According to recent research, more than 90% of excess heat in the atmosphere generated by global warming is absorbed by our oceans. Some 60% of the world ocean is found in the southern hemisphere, making this region a key area of research for scientists studying the role of oceans in climate change. The Southern Ocean has become an area of particular interest because of growing appreciation of its distinctive role in the storage and transport of heat, freshwater and carbon dioxide throughout the world’s oceans. In fact it’s been described as the lungs of the planet because of its vast surface and prolific plant and animal life. I recently discovered a stunning demonstration of how Southern Ocean circulation works, in the form of an animation produced by the Australian National University. Changes occurring in the Southern Ocean’s currents and sea ice affect global climate, although the extreme physical conditions in this region have tended to inhibit observations that enable scientists to closely monitor these changes. During the 2007 International Polar Year, an international multi-disciplinary research program involving scientists from eighteen nations set about building a more complete picture of this circumpolar ocean environment and understanding how the Southern Ocean is likely to respond to and drive global climate change. Such projects have continued to gain momentum, and I discuss a few of these in Wild Sea. Interested readers can also learn more about current work in the region through websites such as the Antarctic Climate and Ecosystems Cooperative Research Centre’s “The Southern Ocean in a Changing Climate” project. One of the reasons I wrote Wild Sea was because I wanted to capture some of the stories of this mysterious and remote ocean, not just through the history of exploration and science, but through the interweaving of its human and natural histories. I think that we need stories that can reconnect us with this little known part of the planet, not just as an ecosystem but because we humans rely on it for its invisible but powerful currents and winds, and the great seasonal heartbeat of its ice, and the role that it plays in absorbing carbon dioxide from the atmosphere. When I voyaged into the Southern Ocean in late 2017, I witnessed the profound changeover that occurs as the ocean and islands and creatures prepare for the brief summer season. I saw glaciers crashing into the ocean, although I did not know whether this was a seasonal phenomenon or a sign of something more sinister. Nevertheless, one of the ideas that struck me was the way in which everything about the Southern Ocean is interconnected, so I chose to finish Wild Sea with the following observation written during that voyage. Perhaps the greatest gift of the Southern Ocean is a sense of connection: catching a leopard seal’s eye, marvelling at a swarm of krill, hearing the triumphant cacophony of king penguins in breeding season, absorbing the unearthly blue of an iceberg, admiring the majesty of the blue whale and being left speechless by the extraordinary power and pureness of purpose in the flight of the wandering albatross. This book has distilled the Southern Ocean to its core elements. It may not be possible to feel a sense of belonging in this vast, complex, fluid environment, but it seems that we can have a sense of connection —with ocean and wind and ice and the myriad of living things. Ultimately, we are all caught within the Southern Ocean’s embrace. One of the problems you talk a lot about is that we’ve become disengaged from the Antarctic Ocean, seeing it as a remote scientific laboratory or a space for industry. Most of the narratives come from the nineteenth century. You cite Amitav Ghosh’s The Great Derangement, which challenged readers to consider why contemporary literary fiction has for the most part failed to engage with climate change. Can you suggest any books for readers that engage with this environment successfully? There are many fiction writers over the past century who have found inspiration in the extreme environment of the Antarctic continent. However, I have found surprisingly few that focus on the surrounding ocean—apart from the iconic whales and penguins that is! Some contemporary Australian writers have used the remote coastlines and islands of southern Australia as the setting for their stories, with the Southern Ocean providing the backdrop for a human-centred narrative. Kim Scott’s That Deadman Dance (2010) is one such story. It is set on the southern coast of Western Australia west of the Nullarbor and is concerned with early interactions between European sealers and whalers and the Aboriginal Noongar people. The Tasmanian writer, Favel Parrett, drew inspiration for her novel When the Night Comes (2014) from her southern voyage aboard the Australian Antarctic research vessel Nella Dan. Elizabeth Leane of the University of Tasmania has written extensively about literary engagement with Antarctica, and she has also compiled a wonderful bibliography, “Representations of Antarctica,” as a resource for those interested in imaginative representatives of the Antarctic region. In my current research about Australians in Antarctica too, I have come across a vast collection of children’s books published between 1800 and 2001, including many set in Antarctica. I am still exploring these but it seems that Antarctic exploration, wildlife and science became an especially popular theme in children’s literature from at least the mid-twentieth century. Finally, I have to mention Rachel Carson’s The Sea Around Us (1951) which, whilst not literary fiction nor indeed about the Southern Ocean in particular, is a compelling reminder of just why the ocean environment is so important to us. Carson, who is perhaps best known for her book Silent Spring about the dangers of pesticides, was an American marine biologist who also wrote a series of books about the sea. The Sea Around Us is the best known of these, and I think it is still one of the most evocative and relevant books ever written – literary or otherwise – about the wonders of the marine environment and its vulnerability to human activities. I would be delighted to hear from any readers who know of particular books that engage with the Southern Ocean – either fiction or literary non-fiction. Finally, because it’s women’s history month, did you come across any achievements by women in the region? Absolutely! As with so many histories of polar exploration and science, the narratives were largely constructed by men and celebrated men’s achievements. This is particularly the case in the so-called ‘heroic age’ of Antarctic exploration, broadly spanning the period from the earliest southern polar expeditions in the late nineteenth century to the end of World War One. Whilst I acknowledge the significance of these stories, I was also keen to find sources that revealed women’s voices and experiences. Membership of these early expeditions of exploration, survey and science tended to be exclusively male, so women were usually only mentioned in the sources in relation to their domestic roles as wives and mothers of the male explorers. I did find some literature concerning some of the earliest known women to voyage to Antarctica, although it is not an area that I chose to focus on in my narrative because of the emphasis on polar exploration rather than on the Southern Ocean. It was not really until the mid-twentieth century, with the shift in focus from exploration to science, that women began to appear in the sources and I was able to bring their stories into the narrative. For example, I begin my chapter on ‘Wind’ with the story of British biologist, Mary Gillham who was one of the first four women scientists to voyage south with an Australian National Antarctic Research Expedition in 1959. Gillham, together with Hope Macpherson, Susan Ingham and Isobel Bennett, were bound for Macquarie Island, a small sub-Antarctic island about midway between New Zealand and Antarctica where Australia established a research base in 1948. I wrote about Gillham’s experiences and observations, both as a way of acknowledging the work of these pioneering women, and to give some insights into their experiences and observations of the Southern Ocean environment. Women began to feature more prominently in the history of Antarctic and Southern Ocean science in the years after World War Two. The American geologist and oceanographic cartographer, Marie Tharp, and marine biologist, Rachel Carson, were amongst those who helped to redefine our understanding of the ocean environment although, it must be said, their work focused on the world ocean rather than the Southern Ocean in particular. Nevertheless, I see them as an important part of the mid-twentieth century Southern Ocean story, and the beginning of a period when increasing numbers of women became involved in voyaging and working in the southern polar region. There are now a number of projects that document and celebrate women’s achievements in Antarctic and Southern Ocean science, including OceanWatch Australia’s tribute, the Scientific Committee on Antarctic Research’s promotion of Women in Antarctic science, and Homeward Bound‘s global collaboration of women in science. There is clearly much more to say about this aspect of women’s history, and I hope to write an article about it later this year.